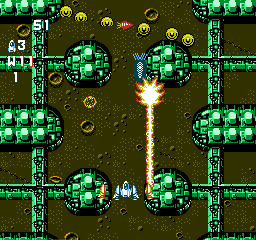 Gun Nac is a vertically scrolling shoot-em-up game that was released in Japan in 1990 and then a year later in America. I was immediately struck by how similar it was to Space Megaforce (SNES, 1992) until I found out they were both developed by Compile. Each has a complicated but deep upgrade system and Gun-Nac features five primary weapons and four secondary bomb types. The main weapons are gained by collecting the items numbered 1-5 with the higher number being the most powerful; these can then be further upgraded by collecting Power P's. It's a nice progression system that encourages you to try out different items and put together a strategy for each situation you face. My only criticism is that it's possible to downgrade your weapon by accidentally collecting a lower numbered item - it's very frustrating when you're trying to dodge bullets and you run into an item that sends you from 5 to 1! The bombs are useful for when things get a bit too hectic and these can be powered up by collecting the different letters that correlate to your current item. One nice feature is that you visit a shop before the start of each level to upgrade your weapon and purchase a Wing that allows you to take two hits instead of one. The levels are long but don't outstay their welcome and each is distinctive enough to stop things getting stale. The bosses have some decent variety but strangely I found them easier than the preceding parts of the levels. Unlike a lot of other NES shooters Gun-Nac has smooth scrolling and absolutely zero slowdown, even when there's tons of bullets and enemies on screen. Be prepared for a challenge though as it's definitely a tough game, especially in the last two levels where deadly fire beams take over the majority of the screen. Gun-Nac is a technical masterpiece on Nintendo's underpowered console and Compile certainly got the best out of the system. If you're looking for a NES shooter give this one a try as it's depth and replayability put most other 8-bit shooters to shame. Random trivia: For some reason the U.S. version of Gun-Nac had a number of things changed or omitted compared to the Famicom release. For example, the final boss was shortened and the ending had several scenes that were completely different.